Seeing that Kotomi had programmed Mamiko so that my clone would perform as though she has been performing for a long time and with perfection. I don't see the need to hang around there. Since my mind is merged with my clone, I would immediately be able to know what happened and be able to control her regardless of my location anyway. If I recall, I was able to time travel. Accidentally found out when I was raped, was very confused back then on why they even attacked me in the first place and feeling the parts of my body they touched being different from what I was used to. What I was brought back to were what my classmate, Haruna Kobayashi, had experienced on the day she was mysteriously frozen stiff. The time I was brought to was the few seconds before I was brought back in time. I even saw myself vanishing into thin air in front of the people who raped me. Come to think of it, I think it is those same people who ran over and stabbed my clone later on. I would like to bring them down, but I don't know anything more about them other than belonging to an organization targeted employees of my company. The director said that I was targeted more than anyone else. Embarrassingly to say, unlike my girlfriend, I myself don't know how it works. Ahhhhhhh!!! I see nothing but bright white light. Next thing I knew, I found my self curled up and asleep on something soft. I tried to get up, but my body feels as though I had been sleeping for hours and struggled to get back up. Since when did I fall asleep? I don't even remember feeling drowsy. And, as though expecting me, I saw two sets of couples with familiar faces, who looked as though they rushed down from work, that appeared before me. I noticed that I was sleeping on a large bean bag and spotted toys for children and my stuff (though it look old) lying around. The place seemed to be a large western-styled house. I can't really see the outside, but commercial products and wall sockets tells me that I'm not overseas. I looked at myself: I'm still wearing my school uniform that consists of dark shoes, folded knee-length socks, a skirt and a blouse with a ribbon and vest. It seems that whatever Kotomi did back then did not affect my physical traits or that the countdown timer only counts how much of my time has passed and will happen if the amount of time that has passed for me when time travelling is equal to the time if I didn't time travel at all to the time Kotomi had set to. Therefore, it has not affected me yet. But who are these people, and how do they know that I would appear in front of them? A woman, who looked very much like me (though older), approached me. She then stared at me for a while and then touched me everywhere as though searching for something. I would mind a lot if people did the same to me, but since she is of the same gender and looks very much like me, I don't really mind as much. I looked at the other people: the other man looks very much like Kotomi and the other man looks like the older me in my male form. The other woman looked like Kotomi's childhood friend, Hiroko Kyohara, that I just met. It seems that I have traveled into the future where the counterparts of people I know are in front of me. But that doesn't explain why there are male and female counterparts of me at the same time. As though knowing what was on my mind, the lady who checked me said that she is my clone while the male is me of my future. I tried to see what my clone is seeing, but instead of the one in front of me, I saw the one of the time I was from. Well changing back seems fair. After all, becoming a girl in the first place was not expected, and that the Kotomi I met at my recent school festival helped to turned it back probably knows that I don't know how to operate my device. What I'm more shocked is that everyone here is married to each other. My female counterpart is pregnant, while Hiroko has a 2-year old child. My future female counterpart said that she was shocked of being able to make and soon give birth to a child. As I found out, her husband is Jun'ichi, Kotomi's younger brother. Both couples have plans to have another child too. On the question of how they know I was coming, my future selves simply said that I am their past selves and know what to expect (what a basic answer...) and knows why I came to their time pane or the time pane I came from, though they add on to say that the only time plane I could come from as myself as a female is the second year of high school, which, to them, is a long time ago. Izumi said that Aiko, her cousin, has succeeded her father as the director of my company. Izumi's older brother, Shin'ichi, is now the assistant director. None of them mentioned anything about Kotomi, neither do they seem to want to talk about it. There was deep silence that only the clock ticking could be heard. Jun'ichi: "Well, Kotomi-oneechan found out that our uncle had done gender-change experiments to her before she was born. He also did the same to my younger brother and sister too. Me and my younger sister, Izumi, are the only children in my family he didn't experiment on. Kotomi said that her life was already ruined since her very birth and that her very existence was a mistake. After finding that out, she went back to a particular festival some time ago, which, to you, is just last week." Me: "Really? No wonder she looked sad and seemed to be enjoying her last days of her life and suddenly, a week later, she's her usual self." Jun'ichi: "Well, after the Christmas of your third high school year, people from that crime organization you might have heard of, had splashed acid at her eyes when she was caught off guard when she was deep in thought of what her uncle did to her. The acid has caused her to permanently go blind on both eyes, made her dizzy, pushed her to the train tracks, and ran away. According to witnesses, she tried to get out of there upon hearing an approaching train. But, being dizzy and just became blind, she doesn't know which way the way out is. Other people tried to guide her way out by shouting, but the noise of the oncoming train and the rail crossing were too loud for her to hear them. Unfortunately, she got hit by an oncoming train and died on the spot. She was the smartest girl ever..."
Itsuki: "Here's the newspaper article from then. You can keep it." My future male self gave me an old-looking newspaper that is dated about a year and a quarter after the time I was from. It's true! They did not lie to me. Tears now seemed to flow out of everyone's eyes. My future selves approach me. Mamiko & Itsuki: "We don't know if this event is fated to happen, but it's possible to ask you, our past selves from the year before it happened, to help us to stop those guys before it happens, or the very least, prevent Kotomi from being hit by the train. We know it might seem impossible as, in our time, it has already happened, but who knows? A miracle can happen." Me: "I can do it? It sounds like a large responsibility and I don't even know where to find them." Mamiko: "Well, we don't expect you to be able to do it, but we would be very happy if you did. Actually, you are the one that would be happy since we are the future you. Everyone around us too. If you still don't believe us, here's a CCTV footage from that day. You can have a copy of this too." She switched on a storybook-sized device that appeared to have nothing on it, inserted a storage medium I never see before attached to it, and somehow ran the video. The image projected was in mid-air. I didn't know that thing was the TV, even more so due to a lack of a visible power chord. The footage first showed a place with only a few people and the tracks visible. The date of the video was the day before the newspaper they gave me. 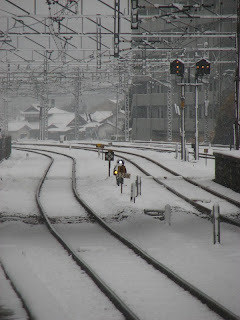 Kotomi was seen walking along the side of the tracks, but with those people being camouflaged in the patch of snow with their white coats, separating the road that runs parallel to the tracks. They look different from the people I always encounter, but the way they approach their victim is the same: to target anyone who works for my company, to, from victim's point of view, appear out of nowhere, harm their target to the extent they think would kill them and the victim not being able to get away, after everything, run away until out of sight and scare bystanders if necessary. I saw them pounce on her, splash some kind of liquid from an unlabelled brown transparent glass bottle at her, and dropped the bottle, smashing it into pieces in the process. Kotomi seem to be screaming in pain as she has both her hands on the eyes and running around aimlessly. Those guys grabbed spun her around many times to make her lose her sense of direction on top of just becoming blind, and pushed her to a patch of slow between the tracks for both directions so that she doesn't know she's there. 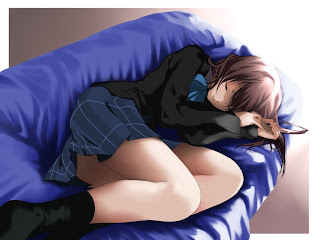 Kotomi manages to get up, but is now clueless as to where she is as her eyes remained forced closed. The rail crossing had lights flashing and the barrier lowered. By now, bystanders on both sides have appeared and appear to be shouting at her. Kotomi now seem to be panicking and crying even more now and runs around in circles, partly because she's still dizzy. Unfortunately, before she reaches safety, a train hit her. A lot of blood was seen splattered around and Kotomi now looked lifeless. Paramedics and police soon appeared (some of them were seen looking at the CCTV camera), moved the train away a bit, cordoned off the area, and covered Kotomi's body completely with a sheet after photos and some samples were taken. I can't believe what I just saw. Mamiko now makes a copy of the video and a digital version of the newspaper report into a file onto a storage medium that devices of my time can read. It looks quite old for something I consider new or current for my time. Mamiko forgave me saying that it's hard to find a fresh new one and strongly recommends that I immediately copy it off to another storage device as it's prone to become unreadable due to age. The Internet is obviously out of the question due to it's time sensitive nature. As they wave at me happily saying "Good luck!" I pressed random buttons in the hope that I would reach my present time and figure out a way to prevent the incident. Seeing that it happens during the winter break, between Christmas and New Years, it's hard to imagine how to prevent due to a lot of people out (increased train frequency) and about on top of it possibly being a snowy day. Also, should I warn Kotomi? If so, when and how? Giving her knowledge of her own death itself could result in a drop in her morale or even commit suicide earlier, but there's also a possibility of preventing the incident from happening in the first place. I found myself inside a room. It seems to be Kotomi's bedroom as the door is locked and I can hear children running around outside. I hurriedly copied the contents of the old-looking storage device onto her computer and transfer them to mine. Maybe I should leave a copy on her computer somewhere. Oh, look at the time! She could be coming home now! I should better power down her computer and head back to my time: Mamiko of my time pane is pretending to be rehearsing but Kotomi seems to be looking high and low for me. I guess I am needed even though I am not acting tomorrow.